Alien Explorations: HR Giger's Woman with Child, 1967 (work 72) references A. Epychaob's "Des Visiteurs Du Cosmos" illustration? 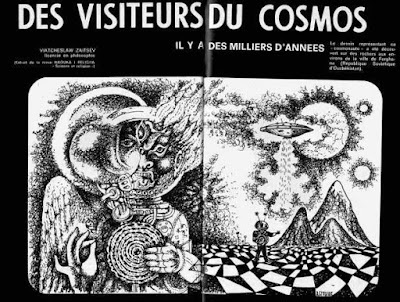 A. Epychaob's "Des Visiteurs Du Cosmos" illustration? a) Illustration for Spoutnik monthly magazine by A. Epychaob for an article "Des Visitors Du Cosmos" published June, 1967. 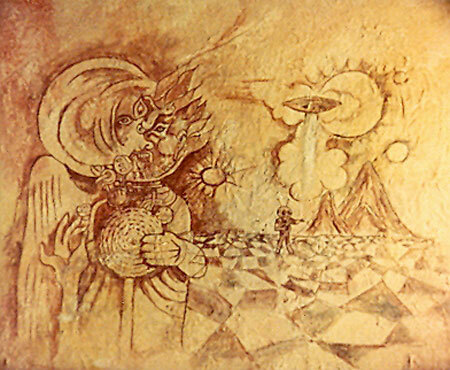 Unfortunately they made a mistake that looked as if they had claimed that this image was of a cave painting in Uzbekistan but apologised for the error in a following issue. Not everyone got the message. Probably would be nice to see more artwork by Epychaob because he put his images together in quite an interesting way. 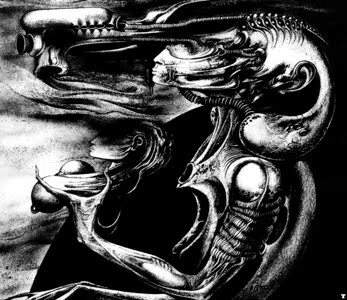 b) As I can make out from comparing the images, HR Giger referenced the humanoid figure from this illustration in his work "Mother And Child" done that year, turning the head the other way around and transforming the whole thing into something else from his own imagination. The disk held in the hand turns mostly into a dark empty space, while the hand on the right transforms into the horizontal lines across the upper arm in Giger's picture. Double page spread from "Des Visitors Du Cosmos"
c) A few years later, Von Daniken published the illustration in his book Gold of the Gods in the 1970s, going with the idea that it was actually a cave painting from Uzbekistan. 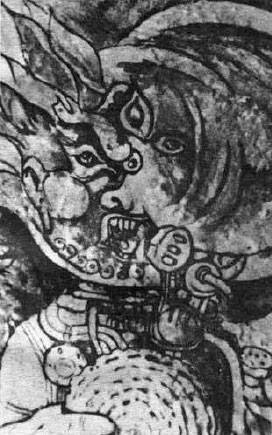 Dr. Saizev's "astronaut" as it appeared in The Gold of the Gods (p. 82). d) More confusion comes with someone's claim that the illustration was based on a cave painting of which there is a photo which more likely appears to be based on the illustration.